Q. How do we order Epinephrine Convenience Kits? A: LifeMed Safety does not sell this product direct. Due to the nature of this product, orders must be made through Concordance Healthcare Solutions. 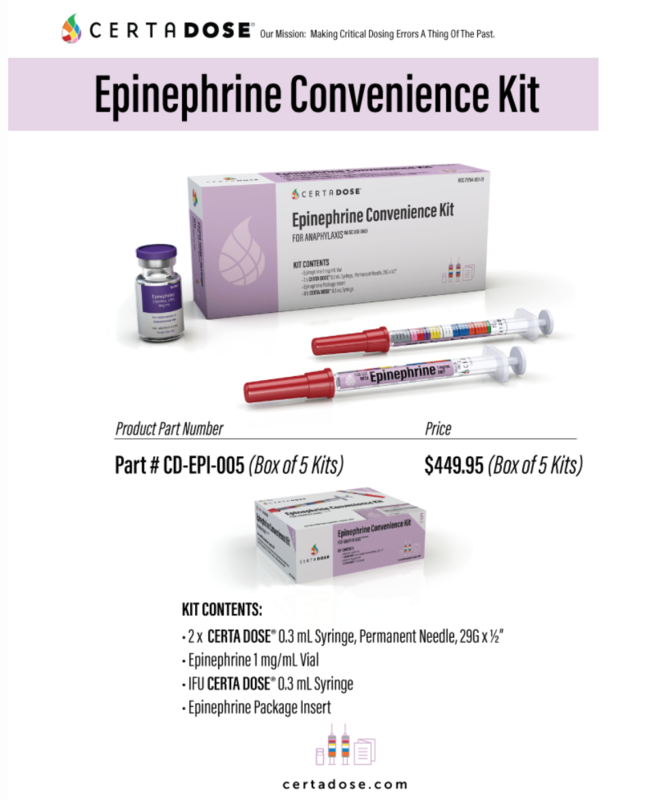 Current Concordance customers may order Epinephrine Convenience Kits by visiting www.concordancehealthcare.com. All others, will need to call 800-473-2332 to set up an account. Q: Do you have other drugs besides epinephrine? A: We plan on offering additional products in the future, including some with additional drugs. Potential future products include Midazolam and others. Note: All potential future products are dependent on FDA clearance and will not be available until clearance has been received. A: Independent and simulated use studies suggest that color-codes syringes may significantly reduce critical dosing errors. Q: Do you have cost justification for utilizing the Certa Dose® Epinephrine Convenience Kit? A: The Certa Dose® Epinephrine Convenience Kit can save approximately $1,000 dollars versus auto-injectors when stocking an ambulance with products that meet regulatory requirements; those savings should increase as these products are used and restocked. Q: What is the volume of epinephrine in the Certa Dose® Epinephrine Convenience Kit? A: Each vial contains 1 mL of epinephrine for intramuscular or subcutaneous injection. Q: How should I store my Certa Dose® Epinephrine Convenience Kit? A: The Certa Dose® Epinephrine Convenience Kit is designed to be stored at room temperature (20 – 25 degrees C or 68 – 77 degrees F). Kits should be kept away from sunlight and should not be frozen. Q: What is the shelf life of the Certa Dose® Epinephrine Convenience Kit? A: Certa Dose® Epinephrine Convenience Kit has a shelf life of up to 24 months from the date of manufacture. Consult product labels for exact expiration date of the Kit. Q: For what size patient is the Certa Dose® Epinephrine Convenience Kit appropriate? A: Certa Dose® Epinephrine Convenience Kit is appropriate for dosing patients from neonate to the 0.3 mg dose. Q: How many doses of epinephrine are in the Certa Dose® Epinephrine Convenience Kit? A: The vial of epinephrine in the Certa Dose Epinephrine Kit contains 1 mL of a 1 mg/mL concentration of epinephrine. Multiple doses are possible depending on the needs of the patient. Q: Where do I administer the epinephrine in the Certa Dose® Epinephrine Convenience Kit? A: Certa Dose® does not offer any recommendations about the use of epinephrine. Please follow your healthcare system’s protocols and your professional medical judgment. Q: Are there any precautions I need to take when administering epinephrine? A: Certa Dose® does not offer any recommendations about the use of epinephrine. Please follow your health care system’s protocols and your professional medical judgment. Watch how easy it is to use the Certa Dose Epinephrine Syringe.